Standard foam board is a versatile, all-around graphic and display board with memory. 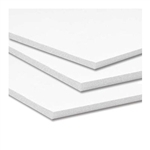 This foam board consists of resilient extruded polystyrene core sandwiched between two layers of bleached, semi-gloss white clay coated paper. Ideal for digital & screen printing, die cutting, mounting, framing and prototypes.